Abuja Nigeria: live uplink broadcast transmission services. Abuja, Nigeria, June 2014: WTS Broadcast was present at the 24th World Economic Forum which was held in Nigeria’s capital, Abuja on the 7th to the 9th of May 2014 to provide live transmission services for CNBC Africa. WTS Broadcast transmitted live from the venue throughout the three day event, supplying satellite uplinked video and audio services via its KU-Band Flyaway. The 24th World Economic Forum brought together regional and global leaders to discuss innovative structural reforms and investments that can sustain the continent’s growth while creating jobs and prosperity for all its citizens. The theme for this year’s summit revolved around converting natural wealth into solutions that address persistent social challenges in Africa. WTS Broadcast is proud to be associated with such an historical event and is honored to have been of service to its prestigious client. 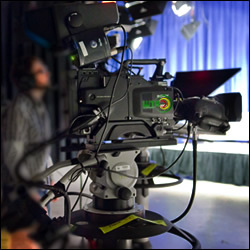 WTS Broadcast welcomes your business proposals to transmit and distribute content.